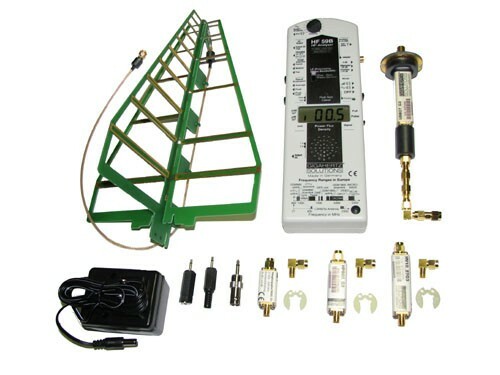 Rated as an Advanced or Professional Level RF Analyzer. Sophisticated Source Identification Plus Enhanced Accuracy Features Make this Radio Frequency Analyzer a Technician's 1st Choice. High Pass Filter HP800 G3: This accessory filters out lower frequency signals (below 800 MHz) allowing for more comprehensive analysis of RF measurements. Optional Pulsed or Analogue Signal Setting: This high–end feature allows for in–depth signal identification and RF risk assessment. Studies show that digital signals have the greatest biological impact. AC/DC Outputs for Data Logging Functions: Allows for thorough test site assessment through data logging. In addition to data logging equipment the HFE59B is designed to interface with computers and the NFA 1000 EMF Analyzer. Three Measuring Ranges: Medium and Fine range options provide added value when needing accurate assessment of moderate to weaker signals. Comes Equipped with the Attenuator DG20 G3: A small device with a big impact, the Attenuator boosts the meter's maximum measuring range by a factor of 100 (20 dB). An increased measuring range means stronger exposure levels can be accurately assessed. strong>Peak Hold Feature: You are guaranteed to accurately capture the peak measurement every time you use the Peak Hold feature. A flick of a switch will instruct the device to identify and hold the peak value measurement. The meter's audio tone replicates the patterns and intensity of measured RF emissions. Plug in ear phone accessory is optional.< Rechargeable Battery + Battery Charger: Comes equipped with both the NiMH rechargeable battery and battery charger Storage/Carrying Case: Case can accommodate an additional RF or EMF meter. Case can accommodate an additional RF or EMF meter.